Sixt is a leading car hire provider with rental stations around the globe. With our locations at Grenoble Isère Airport and the train station, we are ready for your arrival. Whether you are after a luxury or economy car, our extensive fleet will have you covered. Whether you prefer a convertible, luxury car, economy, 4x4 or minibus we have something to fit your requirements. We also offer useful extras such as baby seats, Sat Nav or more insurance coverage which you can include when you book your reservation online. However, please note that only the booked car category can be guaranteed, not a specific model. Grenoble is a city rich with history located in the south east of France and close to the French Alps. Take a drive up to the Bastille, a series of ancient fortifications, for views of the town and the surrounding mountains. For even better views, brave a ride on one of the egg shaped cable cars that will take you to the top where you can relax at one of the restaurants or stop into the military museum. While in Grenoble be sure to visit one of the daily food markets. The most centrally located is at Sainte-Claire Les Halles, which has an indoor hall with cheese and butcher stalls and an outdoor fruit and vegetable market. Pack the boot of your car rental with your purchases and head out for a scenic picnic. 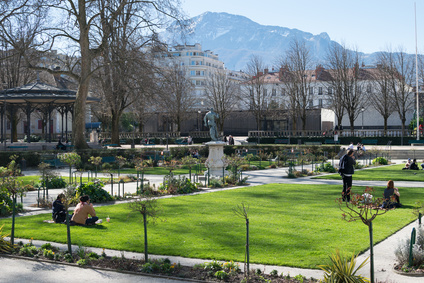 For a more cultural side of Grenoble be sure to visit the Musée de Grenoble. This museum hosts works by Picasso, Matisse, Miro, Kandinsky and Andy Warhol. Enjoy this Capital of the Alps and make the most of your time in this region of France with a car rental.